I just returned from an insightful trip to visit Tsinghua University in Beijing, China. 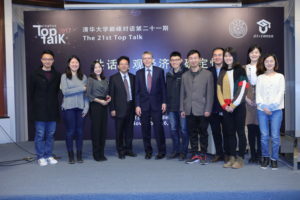 It was a busy few days as I gave four talks in total, three of them at Tsinghua University – the Chen Daisun Memorial Lecture in Economics at the Tsinghua School of Economics and Management, a Tsinghua Top Talk for the Graduate Student Union, and a more academically oriented lecture at the Tsinghua Forum & Tsinghua PBCSF Global Academic Leader Forum at the Tsinghua School of Finance. While I appreciated the opportunity of participating in all three forums, the most fun talk of the three was the Top Talk, in which I was able to share insights with close to 200 energetic graduate students from a variety of fields. Their thoughtful questions led to some interesting exchanges. In my third talk, I shared my perspective on an academic literature on valuation and uncertainty. This allowed me to place some of my recent research into a broader context. In addition, I met with several scholars over a two-day period and found the environment to be intellectually vibrant. 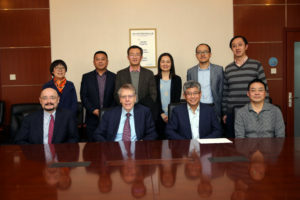 I had the opportunity to talk to some of the administrative leaders, including the university president, Qiu Yong, about potential collaboration between Tsinghua University scholars and the Macro Finance Research Program (MFR) that I oversee at the University of Chicago. Zhiguo He of University of Chicago had set the stage for these conversations. He is a graduate of Tsinghua and continues to spend time there and collaborates with some of the researchers. He, along with Hui Chen of MIT and others, are keenly interested in furthering the study of credit opportunities, financial restrictions, and investment in China. 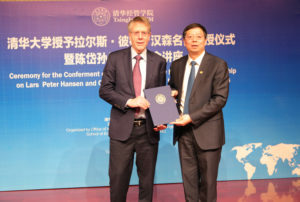 Tsinghua University was kind enough to make me an Honorary Professor. I was a bit mischievous and asked if the title came with tenure. China has much to be proud of given its pace of economic development. It has a truly remarkable history. The cultural revolution was very harmful to intellectual endeavors and the nurturing of scholarship. Luckily, it did not fully deplete the stock of human capital so that more open markets including the market for ideas have contributed to China’s economic success. While this transition has been remarkable, there is some cause for concern going forward. The state-owned banks continue to play a prominent role in financing businesses. On the other hand, the shadow-banking sector has arguably been better suited to support new ventures and to nurture creative entrepreneurial activity. There is potential for the government to limit this outside activity to ensure financial stability, but this could inhibit productive investments and retard economic growth. On Saturday, I was pleased to speak at an event hosted by the National Economics Foundation that honored Gregory Chow and Xiaohong Chen as the new winners of the “2017 China Economics Prize.” Both researchers have made important contributions to econometrics over the last several decades. Interestingly, Xiaohong was born 36 years after Gregory. As many people noted, in addition to his intellectual contributions, Gregory contributed to Chinese scholarship in economics by helping to open the door for many promising scholars in China to attend graduate schools in the United States. Xiaohong Chen was actually one of the initial scholars to benefit from Gregory’s efforts and received her PhD degree at the University of California, San Diego. Gregory was very kind to me early in my career. Just out of graduate school, I participated in an Economic Dynamics and Control Society conference in Cambridge, England. Gregory was the President of the Society at the time. He was very kind for welcoming me to the event and for allowing me to present joint work with Tom Sargent. When you know a thing, hold that you know it; and when you do not know a thing, allow that you do not know it – this is knowledge. You can find and download my Chen Daisun Memorial Lecture in Economics slides here, my slides in recognition of Chen and Chow here, my academic lecture slides here and my student talk slides here.